Weird Worlds: Return to Infinite Space is a hybrid Roguelike game of space exploration, adventure and starship combat set within a peculiar as yet unvisited region of the galaxy known as the Purple Void. Each time you play the game, a new and different “instant space opera” is generated. From the locations of stars and nebulae to plot-twisting quest events, nothing stays the same. Unlike many other games of its kind that go on for dozens of hours, Weird Worlds plays to its conclusion in less than thirty minutes – It’s the perfect lunch break game! 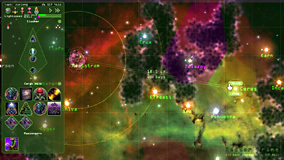 Features also include a fully animated star map, a unique turn-based movement system, real-time starship battles, succulent graphics and award-winning music and sound. Weird Worlds also supports user-made mods that can change any and all aspects of the game and keep the universe expanding indefinitely. Customers who have obtained Weird Worlds through Desura or Steam will receive updates to the game through the vendor. Those who bought the game on a CD or as a download from Shrapnel Games can download the following file to upgrade their copy of the game. Note that you will need to tell the self-extractor the folder where the game (weird.exe) is located.